Read & Submit Jokes, Quotes and Horror Stories. Above all you must have fun here especially if it's at the IRS' expense! 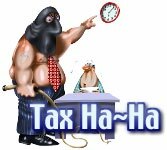 Do you have your own Tax Horror Story? If you do you could win $100. Submit your story to share your experience with others, & the best submited story each month will win $100. We own a small business and...Our accountant died after 18 years...while we attempted to replace the best accountant ever, our penalties and interest grew uncontrollably! The first accountant we brought our papers to worked out of his home and shortly after taking us on, he had incurred an uproar of family members moving in and out for numerous reasons. In the uproar, all of our papers (boxes) were missing and he had not yet started the work, as promissed. Another quarter gone...more penalties!! We finally convinced a revenue officer to go to the accountant and explain that he must find our boxes. (Nevermind the fact that we never paid attention to the flow of forms, due dates, general processes...David always took care of everything...Sign here...Write check in this amount...Mail here. We were in such a panic, we actually let the new accountant take all of our original papers ...DON'T DO THAT!! )This nightmare went on for 8 months, when we found an angel accountant who handled the situation with grace and efficientcy and helped us to have some of the penalties dropped. Needless to say, we are still (After 4 years) paying this off. The moral to the story...Do read those pamphlets and piles of info sent as bulk...Do ask questions...never be afraid to call the IRS and ask for help! •How have you managed to buy such a luxurious villa while your income is so low?" asked the IRS auditor. "Well," the taxpayer answered, "while fishing last summer I have caught a large golden fish. When I took it off the hook, the fish opened his mouth and said, 'I am a magical fish. Throw me back to the sea and I'll give you the most luxurious villa you have ever seen'. I threw the fish back to the sea, and got the villa." "How can you prove such an unbelievable story?" "Well, you can see the villa, can't you?" A businessman on his deathbed called his friend and said, "Bill, I want you to promise me that when I die you will have my remains cremated." "And what," his friend asked, "do you want me to do with your ashes?" The businessman said, "Just put them in an envelope and mail them to the Internal Revenue Service and write on the envelope, "Now you have everything." But in this world nothing is certain but death and taxes. The hardest thing in the world to understand is income tax! The trick is to stop thinking of it as 'your' money. The Government that robs Peter to pay Paul can always depend upon the support of Paul.